Try to save the Count of Kvatch, and rid the city of any remaining Daedra. Help Savlian Matius fight through the Daedra to reach the castle gates. You are sent to Berich Inian in the Chapel of Akatosh to collect the key to the guard house. Acquire the key, rally your new reinforcements, and make your way through the tunnels to get to the gatehouse and open the gates. Reach and storm the castle, clearing out the Daedra infestation. Find the count's corpse, and recover his signet ring. Return to Savlian Matius with news of the count's death and his ring to finish the quest, and receive your reward. Whenever you're ready, speak to Savlian Matius to begin the battle. Follow him out of the chapel and wipe out the Daedra. If any other soldiers survived the previous quest, they will continue to accompany Savlian and help with the attack. Savlian is essential, so he cannot be killed. However, the rest of your allies are mortal and unleveled. Keeping them alive - although optional - is a notorious challenge at high levels. Eventually, Savlian and his men will reach the path that leads to the castle only to find that the gate has been sealed. He sends you to find Berich Inian, who has the key to the guardhouse. When you return to the chapel, you will meet reinforcements: two Imperial Legion Soldiers and one Imperial Legion Archer tell you that they saw the smoke from the Gold Road. Ask them to follow you, then talk to Berich. He will lead you into the Chapel Undercroft, where you will encounter several Daedra. At the far end of the Chapel Undercroft is a door leading back outside. Berich will lead you through the city streets, fighting Daedra as you go, to a hidden tunnel that leads to the gatehouse. Once there, Berich will open a locked trapdoor with his key and depart, leaving you and your Imperial Legion soldiers to it. If Berich gets killed at any point on your way toward the gatehouse, you will have to loot the key to the trapdoor from his corpse and open the trapdoor yourself. The tunnel is straightforward and free of enemies. At the end, take the ladder up and into the gatehouse. On the upper level of the gatehouse is a turn wheel which opens the gates. Berich, Savlian and any remaining men will rush headlong into the courtyard. Clear the courtyard of any remaining Daedra. Once the courtyard is clear, Savlian will run into the castle. Approach him and he'll tell you to go find the Count of Kvatch while he takes care of the main hall. He and his soldiers will remain at the entrance to the throne room. Only the Imperial Legionnaires will follow you as far as the entrance to the next area. Be sure to grab A Dance in Fire, v4 - an Acrobatics skill book - from a table in the Great Hall immediately to your right. Fight your way through the Great Hall towards the north end, where there is a passage leading to the Count's bedroom. Count Ormellius Goldwine is dead in his chambers; there is no possible way to save him. When you find the count, a quest update will tell you to at least take his Colovian Signet Ring back to Savlian. Back in the main hall, inform Savlian of the Count's death to complete the quest. If you give him the ring, he'll give you his Kvatch Cuirass in return. The leveled light armor cuirass fortifies Strength and Endurance by two to eight points. This quest is optional to the main quest line, although you will need to finish it off in order to receive help from Kvatch during Allies for Bruma and to be able to complete the Restoration master trainer quest. If you talk to Brother Martin, he will follow you throughout this quest. Since he is essential and has powerful Destruction spells, he can make this quest much easier. 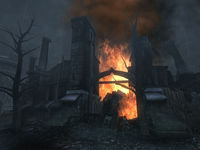 However, be sure to fetch him before the conversation between Savlian and Tierra is finished, as Martin will leave Kvatch during the evacuation. If you miss talking to him before he leaves, you can catch him as he walks to the camp and get him to come back to the chapel with you. Keeping your allies alive during this quest can be a major challenge. Having a heal other spell and topping up your allies' health after each segment can be very helpful. If you get to a point that is safe from enemies, wait at least one hour, and your allies' health will be fully replenished. Upon discovering that the castle gates are closed, leave the area quickly, as your allies will be taking fire from continuously respawning enemies up on the battlements while you are present. When opening the gate, you will usually get swarmed by enemies and your allies will be constantly getting in your way. The gate blocks all attacks and spells except for touch-range spells. Since daedra rarely use these, it is possible to draw them to the closed gate and kill them with on-touch spells yourself. Some swings from daedra and the player can also pass through the gate, and daedra can sometimes pop through if there are many pushing each other into the gate. One additional trick is to make a cheap custom spell that paralyzes for a short while. Dash in and paralyze all enemies on sight and let your allies mop them up. This also assures that your allies won't be killed by friendly fire. If you fancy heavy armor, you can take a set from one of the Imperial soldiers if they die, this armor will probably be much better than your own if you have just started the game, additionally it might be worthwhile to let the Kvatch guards die, as one of them carries a silver battle axe which can be useful at lower levels. 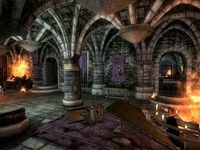 By taking the generic ring from the Count's inventory, exiting the Count's bedroom back into the main hall, then returning to the bedroom and looting the Count again. The signet ring should now be visible in his inventory. By using the 'Take All' button to loot everything from the Count's body. Even though it is not visible in his inventory, the signet ring will be taken along with all of the other items. Berich Inian might get stuck in the Chapel Undercroft. Since he is needed to open the gate unless he dies, you will not be able to move on in the quest. To get him out, just re-enter and exit the Undercroft, and he will appear. If this does not work, walk over to him and he should begin to move. Daedra will usually keep showing up on the walls above the castle gate, firing arrows or ranged spells. This may prevent Savlian from noticing the gate is locked. You cannot interact with Savlian at this point, unless you kill the enemies fast enough (an area effect ranged spell fired at the ramparts can be quite effective) or knock Savlian unconscious. You can talk to him for about five seconds once he gets back on his feet, but while running from left to right in front of the castle gate, he will only tell you "We have to reach the castle gate!" Be careful with the second approach, as you may gain a bounty, causing the guards around you to try to arrest you. You can solve this by using the console to turn off AI detection for Savlian. Select him and enter tdetect followed by stopcombat. He should now notice the gate, therefore advancing the quest. Don't forget to use tdetect on him again to turn his AI detection back on before continuing. This can also be fixed by leaving Kvatch and coming back again several days later, giving the Daedra time to repopulate. This will pull Savlian away from the gate to fight them. He will be out of range of the archers, but he will still recognize that you have previously made it to the gate. Once you have killed all the Daedra on the ground, you can speak to him to trigger his dialogue about the gate being closed. If the quest has been finished and Savlian still stands in the castle, he will not have the dialog option 'Martin', and instead say "Kvatch was rebuilt from ruins once, and she'll do it again. ", causing you to have to look for him yourself. It is possible to steal the Colovian Signet Ring from Savlian Matius after the quest ends. Because it is a quest item, it is impossible to drop for the rest of the game. 10 Savlian Matius has asked me to help with the next phase of the battle for Kvatch. I should speak to him when I'm ready. 20 I need to accompany Savlian Matius to the gates of Castle Kvatch. 30 I need to look for Berich Inian in Kvatch's Chapel, and ask him for a key to the Guard House. 40 Berich Inian has agreed to lead me through Kvatch. I need to follow him through the city to reach the guard house, and gain access to the Castle Gatehouse. 45 Berich Inian has died. I need to get the guard house key off his body and proceed on my own. 50 I've found the tunnel entrance in Kvatch. I need to follow it to the gatehouse, so I can raise the gates and let the guards into the castle courtyard. 60 I've raised the gates into Castle Kvatch. I must now help Savlian and his men defeat the monsters within. 70 I need to follow Savlian Matius into Castle Kvatch, and help find the Count of Kvatch, Ormellius Goldwine. 90 I've found the body of Count Goldwine. I should deliver his signet ring to Savlian Matius. 100 Finishes quest Castle Kvatch is now safely under Savlian Matius' control. It is possible to use the console to advance through the quest by entering setstage MS49 stage, where stage is the number of the stage you wish to complete. It is not possible to un-complete (i.e. go back) quest stages. See SetStage for more information. This page was last modified on 16 February 2019, at 01:19.